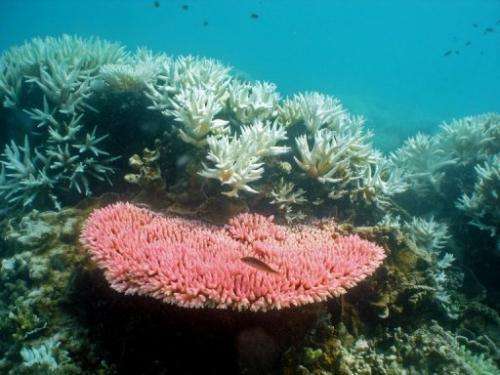 A handout photo from the Australian Institute of Marine Science on October 2, 2012 shows coral reef at Halfway Island, on the Great Barrier Reef. Australian scientists mapping the Great Barrier Reef have discovered corals at depths never before thought possible, with a deep-sea robot finding specimens in waters nearly as dark as night. Australian scientists mapping the Great Barrier Reef have discovered corals at depths never before thought possible, with a deep-sea robot finding specimens in waters nearly as dark as night. A team from the University of Queensland's Seaview Survey announced the unprecedented discovery 125 metres (410 feet) below the surface at Ribbon Reef, near the Torres Strait and at the edge of the Australian continental shelf. Ove Hoegh-Guldberg, chief scientist on the project, told AFP that coral had previously only been shown to exist to depths of 70 metres and the finding could bring new understanding about how reefs spawn and grow. "What's really cool is that these corals still have photosynthetic symibionts that supposedly still harvest the light," Hoegh-Guldberg told AFP. "It's interesting to know how they can handle such low light conditions—it's very deep dusk, you can barely make out much at the bottom." Researchers were particularly interested in how the coral reproduced at such depths. Shallow corals mate in a synchronised spawning event triggered by the moon which Hoegh-Guldberg said would be "very hard to see" at 125m. "We don't know the answer to that yet, they may be doing very different things to what shallow water corals do," he said. The deep water corals had been found to have weathered storms on the reef much better than those closer to the surface and he said the team was also looking at how ocean acidification and warming was impacting deeper reefs. Hoegh-Guldberg said the team had been lucky to be able to dispatch the diving robot—unusually calm conditions had allowed their ship to stop on the windward side of the reef where large waves typically prevent access. "No one's ever seen these places. It's pretty rare on the planet today," he said. The survey has had a number of successes, with checks under way on a number of specimens Hoegh-Guldberg said were thought to be new species records for Australia "and may even be completely new to science". "It's just showing that we do have rich communities that can reach into the deep water," he said. "We are yet to discover many corners of the Earth." Price to save coral reefs is "one year of GDP growth"